Easily create an Online Course and deliver it to your Audience in a Snap. Choose from our professionally designed Course Templates and Layouts. WPEP enables you to structure Information into Modules (or Sections) and Lessons. Each Lesson can contain Text, Images and Videos. This Content Type is powered by our Blink of an Eye Course Builder which allows you to Create and Manage your Course from one single Page. Publish and build an archive of long-form video content. Especially suited for Publishing Office Hours, Webinar, Coaching Calls, What’s Working Now Tutorials, Presentations, Podcast Recordings and making them available for your members on your Index Page ie. Membership Portal. You can also create a basic Course by Publishing a set of longform videos and assign them to a specific Category. Publish and make your Ebooks, How To Guides, Pdf’s, Implementation Plans and Documents available to your Audience. You can also use this Content Type if the Value you want to share with your Members requires an Image and URL. You can insert any URL pointing to a digital file hosted on any third party service that you want your Members to download or to any URL that you want them to reach upon click. Also use this to redirect your Members to a Sales or Landing Page or to an Optin Page or Membership Upgrade Page etc. Publish Deals, Teasers, Offers, Promotions and Discounts to your Members. You can also use this Content Type if the Value you want to share with your Members requires you to display a Title a Short Description a list of Information an Image and a Button which links to any kind of URL. You can insert any URL pointing to a digital file hosted on any third party service that you want your Members to download or to any URL that you want them to reach upon click. 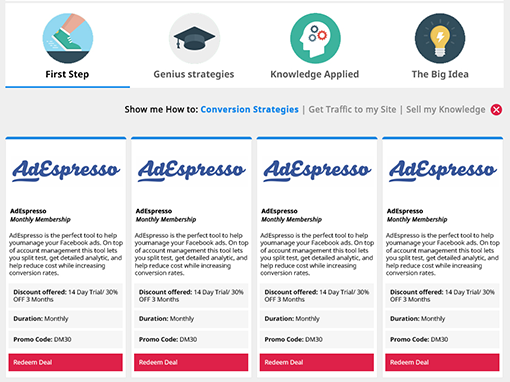 Also use this to redirect your Members to a Sales, Deals or Landing Page or to an Optin Page or Membership Upgrade Page etc. Add Powerful Assessments to your Courses and Quizz your Students with this very comprehensive Testing Environment Builder. You have full control over the Test Journey Design that your students will go thru after completing a Section or Module of a Course. You can grade your students manually, automatically, mixed, not at all or even set a grading requirement. Optionally you can allow students to view their submitted answers and you can restrict the submission to allow them to take the test only once or any number of times. You can also shuffle the questions, answers or both. The Index Page List Item is a horizontally oriented, redirect to Content or URL Item, you can now add to your Content Library Index Page. It contains a picture, a headline, a description and a button element, all customizable. Up until Version 1.11, WPEP had only vertically oriented redirect to Content or URL Items and Presentation Cards. This new addition gives you one more option or alternative to present your Content to your Audience or redirect them to any URL on your platform or the Web.